Leo the Lion is proud, expressive and prone to sudden outbursts of enthusiasm. Leo’s totem is the magnificent Lion. Leo's season is the peak of Summer when the fruit is ripening on the vine. We don't like to play favorites, but Leo is close to our heart—and is ruled by the heart, too. Its ruler the Sun hints at Leo's big light. Often Leo has a personality that lights up the room. And Leo has that sunburst in its nature, that has a cheering effect on others. You've heard Leo is selfish, and that's a side effect of being wholly self-centered—centered in the self. One dark side Leo is addicted to admiration and has disdain for those that are beneath her. Leo has that queenly or kingly carriage naturally, and it's powerful when it's a natural aristocracy, one based on merit and strength of character. Leo in love is fiercely protective of its pride, and that extends out to mate and cubs. The Leo nature is gregarious, proud, larger-than-life and ambitious. Leo creates from the heart, is a natural with children and a red-hot lover. The Lion is proud in love, as in all things. The merest slight—or perceived slight—can have Leo backing away from a potential romance. Leo is sensitive to the atmosphere and likes it to be dignified, yet friendly. The Lion tends to be colorful, with the human equivalent of fancy plumage. Your Leo will notice if you take care in selecting the scenes for wining and dining. And, of course, will appreciate the gifts, love tokens, brought to them on the first or thousandth date. Leo's selfish streak makes them demanding, and that's why they're not a good match for those who will do their bidding. Eventually, Leo will lose respect for the one that's bending over backward to please. Secretly, Leo wants someone who will hold their own and is a strong character in their own right. At the extreme edges, Leo has an eclipsing ego and is constantly needing attention. This can be utterly draining to those around them. Leo thrives on respect and attracts this with a dignified, commanding air about them.They're drawn to the finer things in life, and work that engages them totally. Many have polished public persona, and are often in the limelight. Leo's charisma and love of life is a magnet for friends and children. The amazing thing about Leo is their natural spontaneous creativity. And it can't be separated from who they are—their special spark is what drives their art. The charisma that wins admirers can also win fans, in any field, they venture into. The element is Fire (enthusiastic, igniting). The phrase is "I will." Body Association: heart, back (spine), circulatory system, spleen, hair. Colors are gilded (gold), red, orange, sunflower yellow. Gemstones are amber, carnelian, cat’s eye, tiger’s eye, golden topaz, rose quartz (for the heart), orange calcite, sunstone. Flowers that turn toward the Sun, like sunflowers, Indian heliotrope, cherry pie and the scarlet pimpernel.Deep yellow, golden or orange blooms like yellow hibiscus, gerbera, gladiola, yellow lily, marigold, sunburst, zinnia. Animals the felines, of course! Lions, tigers, lynx, wildcat, kitty cat, panthers, cougars, and the mythical sphinx. Visually stunning animals--majestic horses (thoroughbreds, Arabian, Percheron), peacocks, swans, hummingbirds. Leo lights up the room, is quick to laugh and a natural-born leader. The Lion or Lioness wants to be admired, for his/her style, creativity, performance and general fabulousness. Many lead colorful lives, with many high points of celebration, great loves, adventure, achievement. 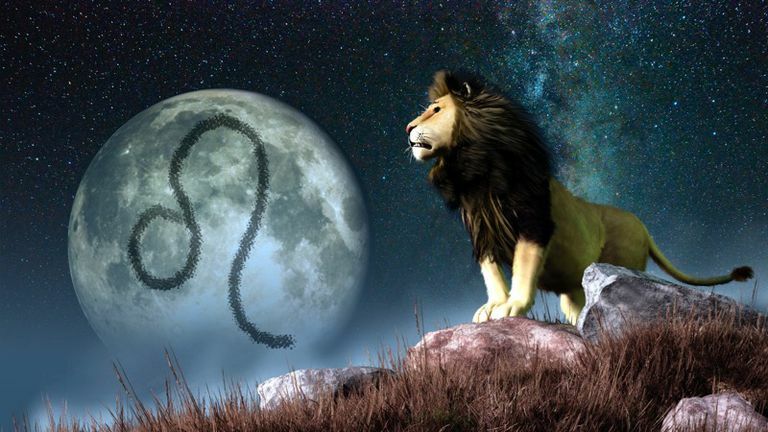 *The dates for Leo change every year, so check an ephemeris if you're on the cusp. Leo season is the peak of summer when its ruler the Sun itself shines brightest.